Diamond Environmental Services, a San Diego toilet rental company, is charged with tampering vehicles to hide emissions levels. 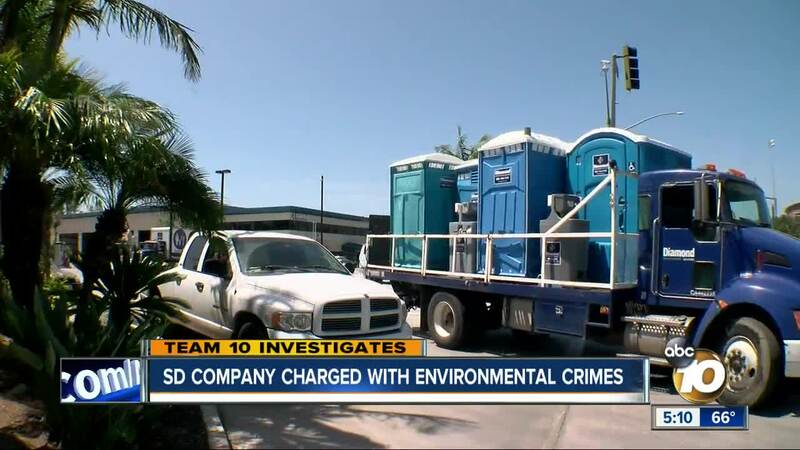 SAN MARCOS, Calif. (KGTV) - A local portable toilet rental company is charged with tampering with equipment on its trucks to skirt emissions regulations. Employees also allegedly faked some of the smog test results. Team 10 Investigative Reporter Jennifer Kastner went to San Marcos’ Diamond Environmental Services on Friday afternoon, but was asked to leave. 10News was looking for answers to the alarming accusations that the company and some of its employees were committing crimes against the environment. Part of a video on the company’s website states, “Diamond's dedication to doing the right thing goes above and beyond.” Yet prosecutors say Diamond was preparing false smog test results to get passing results. Additionally, executives were allegedly tampering with emission control devices on its diesel truck fleet, re-programming the emission monitoring devices to avoid extra costs that come with burning off dirty, soot-filled diesel filters. Rodriguez says he's worked on Diamond's smaller trucks but not the ones that are part of this new six count federal indictment. The U.S. Attorney’s Office claims that Diamond took the devices out of trucks and shipped them out of California to be re-programmed. Owner and manager Arie Eric De Jong III, manager Warren Van Dam and technician Jorge Leyva Rodriguez are facing time behind bars and thousands of dollars in fines. The company declined an interview during our visit to the headquarters on Friday afternoon.